I keep on seeing stories about white animals, and thought I should look up the recent sightings. Like many people I assumed these white or albino animals are pretty rare, and that they have different meanings in various belief systems. Little did I know. There are people positing new significance to these animals. And it turns out that I shared some misconceptions about the rarity of white animals. So down a path- from online videos, science of albinos, white buffaloes, white squirrel colonies, to pagan beliefs- I went. I was surprised with the white animal videos I found on YouTube, including some connecting Native American prophecy and the Book of Revelations in the Bible to ‘white’ animals. These videos imply that these are new, never before seen white (not albino) species which will herald in the second coming of Christ. (Look at the comments for clarity on this.) When people start putting together videos stating that these are ‘white’ animals and not albinos, I had to wonder if they there was any related science. Miracle© was born white with dark eyes (so she was at least not an albino), but she went through several colors and was dark brown when she died at only 10 years of age in August 2004 (~1 month before her death- people stated she was turning white again- I’m guessing after that upcoming winter’s coat- but this is not apparent in her last photo). So to me it’s unclear what Miracle© was, but she was clearly not white when she died. (And I couldn’t find any indication there was DNA testing to prove she was all buffalo.) But this ‘end times’ video ignores the fact that this buffalo did not remain white, as their premise is that these types of animals are new ‘white’ strains from God. But tying the birth of Miracle to the start of Revelations prophecies? What about the birth of Big Medicine (1933-1959), a male true white (not albino) bison? Or the many other true white bisons (ones who remained white their entire lives)? I took this video to imply that the creation by god of large numbers of new ‘white’ animals is recent, and started about the same time that Miracle came along. (Which is coincidentally near the turn of the Millenium.) This would be an interesting premise along biological lines, worth looking into. So off to the web I went. 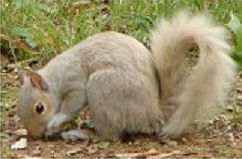 Non-albino (leucistic) white squirrel, Covington, TN. 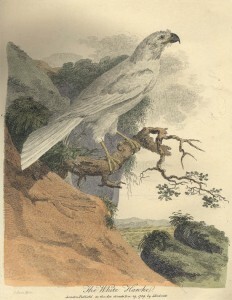 Of course white animals (albino, or non-albino) have always been around. (Like the white (non-albino) moose in Foyalet, and other areas of Canada for the last 40 years.) There are early photos (some from 1930s encyclopedias) of albino animals & descriptions of the many differing types of albinism. Of course there are lots of modern photos of white animals- one of the best sites I found for this is 35 Ghosts of Nature—Albino Animals of the Wild. 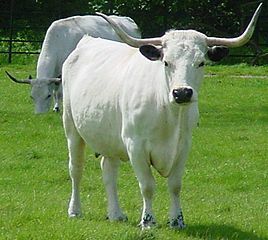 The British White Park Cattle & British White Cattle have been present in the British Isles since ‘time immemorial’ and are well documented. Great white bulls and cows figure prominently in Celtic folklore, including the Cattle Raid of Cooley first put to paper in 8th century Ireland. Jupiter/Zeus (as the prince of light) and other Olympian gods had white animals sacrificed to them, so we know there were white animals in ancient Greece and Rome. White animals were sacrificed to some gods, and white horses sacred in early Heathen worship. White animals (white reindeer, cows, sheep, etc.) were also important to the shamanistic religion of the Sami people of northern Scandinavia prior to Christianity. In the Celtic, Welsh, Sumerian, southeast Asian, and native American myths or beliefs various white animals are sacred; these ancient mythical and historical white animal associations go on and on. That was the end of my research into white animals for now. I couldn’t find data to support white animals being more prevalent in the last few years. I learned that albino and non-albino animals have been around as long as humans have had written records. In a quick review I found several ancient Pagan societies that held white animals in high regard- I’m sure there are many more. Going through all of this I remembered seeing more white animals in my youth- but only because many populations of animals have declined drastically since then. If a fascination with white animals leads people to look out of their windows and to know the local animals that would be worthy, but please apply some reasoned thinking. Knowing the history behind beliefs- not just from Native American or Christian but from Pagan or other sources as well- informs us about who we are now. Note: this article was reformatted, and a revised video link added on April 17, 2014.
i was waking alone findhorn bay in scotland when i saw a white ferrit amazing.